INSPIRE Church (inspirechurch.tv), based out of Waikele, Hawaii, recently had the opportunity to ‘test drive’ three different DPA Microphones, the d:screet Necklace Microphone, the d:ﬁne Directional Headset Microphone and the d:vote Instrument Microphone. I have to admit, when I ﬁrst opened the box with the different mics inside, I had a mixture of emotions. New equipment day is always a cause for excitement for the techies and gearheads around the ofﬁce but we were really satisﬁed with the comfort, adjustability and performance of our current product so I was a bit skeptical that anything would outperform what we had in all the areas that were important to us. I was wrong. The biggest surprise was the d:screet Necklace Microphone. Our sound technicians were obviously excited to try out this unique conﬁguration but worried about feedback issues. One of our female speakers saw it and immediately said, “I want that! It won’t mess up my hair after all the time I spend getting it ready.” We used it that weekend for a service and it performed well beyond anyone’s expectations. The technicians did have a little more adjusting to do to get the sound dialed in for a natural sounding voice due to the capsule being placed beneath the chin, but the mic does come with a high frequency boost cap for that exact reason. Even so, the EQ we would normally use left the speaker sounding boxy and hollow but I found that backing off on the gain a bit and ﬂattening the mids and highs more than normal cleared up all of the problems there. We were fortunate enough to have a men’s conference and several guest speakers come through our doors during our demo period. This gave us an opportunity to try out the products with various voice timbres and at our different locations that are all drastically sonically diverse. By coincidence, two of our speakers wore hearing aids. We wanted to use the necklace just to use it, but they both mentioned how convenient it was when using the d:ﬁne Headset not to have to remove a hearing aid or try to manipulate a traditional over-the-ear headset around their devices. 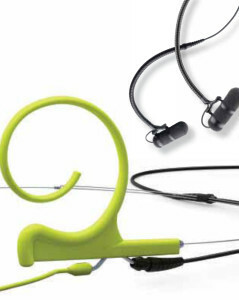 Another one of the speakers prefers to use a dual-ear headset. He looked uncertain when I handed him the d:ﬁ ne Headset with the optional dual-ear headband. It does appear delicate and unstable at ﬁ rst glance but as I helped him put it on, he commented on how easy it would be to forget that he was even wearing a mic – it was that lightweight and comfortable. The ﬁ nal test; as he shook his head around (more than anyone would do during an actual presentation, a look of surprise crossed his face as the mic stayed ﬁ rmly in place. After he was done speaking, he hunted me down to comment on how great the clarity of the sound was during his talk. The fact that international speakers who constantly use a wide variety of equipment would ﬁ nd a product worthy of comment is enough of a testament for me. And I have to admit, I was often paying more attention to the pristine quality of the sound with both of the DPA microphones we tried out that I would lose track of what the speaker was saying. Granted, this probably isn’t a problem that most listeners will succumb to, but the average congregant will be more comfortable and feel that “something is better, but I don’t know what” feeling that all really good equipment changes should evoke. We used the d:vote 4099G Instrument Microphone for acoustic guitar the least of the three, mainly to give it a good listen in rehearsals. The sound replication was beautiful and again, the performer commented that we had gotten his acoustic guitar to sound more natural than he had ever heard. We were excited about the possibility of blending the d:vote and the guitar’s onboard electronics to get an amazing tone during studio recording. The one drawback we found with this mic was a large amount of sound bleed from the stage noise. Even with the mixing board gain rolled as far back as practical, the vocals from the guitar player would bleed into the signal path. Given more time and a little tweaking here and there, this issue could surely be improved on, if not fully resolved. All in all, everyone involved fell in love with the ease of use, the comfort, and most of all the unspoiled replication and transparency of the original signal that the DPA Microphone’s had to offer. The only argument from the average church might be the ﬁ nancial outlay. 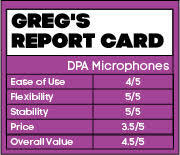 DPA Microphone’s are deﬁ nitely on the higher end of the price range and many organizations may not have the money to invest, or the sound system to really hear, the clarity these mics offer. This is not to say that the value of the microphones is not set properly; anyone seeking to invest in upgrades to their systems will deﬁ nitely see positive results. With history of quality going back 20 years, a two or ﬁ ve year warranty (depending on type of capsule) and a world-wide network available to service this warranty, any equipment failure concerns should be minimized. At the end of the day, any of the products that we tested would be a great solution for sound reinforcement at any house of worship. Greg Fritz is on staff at Inspire Church and has been actively involved with both the Sound and Worship Ministries for around 9 years.